Microfiber or microfibre is synthetic fiber finer than one denier or decitex/thread. This is smaller than the diameter of a strand of silk (which is approximately one denier), which is itself about 1/5 the diameter of a human hair. The most common types of microfibers are made from polyesters, polyamides (e.g., nylon, Kevlar, Nomex, trogamide), or a conjugation of polyester, polyamide, and polypropylene (Prolen). Microfiber is used to make mats, knits, and weaves for apparel, upholstery, industrial filters, and cleaning products. The shape, size, and combinations of synthetic fibers are selected for specific characteristics, including softness, toughness, absorption, water repellency, electrostatics, and filtering capabilities. Microfiber fabrics can be designed for several different characteristics. Not just drying. It is possible to design the fibre in such a way that it actually repells dirt. Microfibers can be made into very specific shapes. The shape of a microscopic fiber have a big impact on how the fabric interacts with a certain substance. A most fabric fibers have the same shape and form all over, which is often just a round shape. Microscopic fibers can be designed to have a very specific shape and form. It is even possible to combine certain shaped with each other. 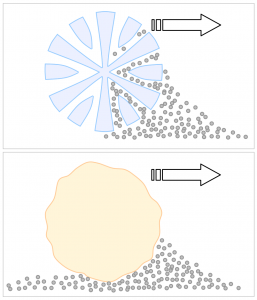 The image on the right shows how a cotton fiber just pushes particles along, but the microfiber lifts them up and holds them there. In the real world, this means that the cotton fabric would drag dirt and other particles over the surface, the microfiber will actually lift up the particles and hold them, preventing them from contacting the surface you are wiping. Although microfiber towels are exceptionally good at preventing swirls, they aren’t perfect. The chance of causing swirls is minimized by a huge amount, but it is not 100% gone. It is still possible to create surface imperfections with a microfiber towel. However, these imperfections are very small and don’t need a lot of effort to remove. By the time you have wiped the surface enough times to create noticeable imperfections, it is very likely that other circumstances have caused enough imperfections that you need to polish any way. It is even likely that these other imperfections are more noticeable then the swirls caused by microfiber towels. Just because a manufacturer claims that their fabric is microfiber, doesn’t prove the quality. There is a huge difference between microfiber towel that can be bought at ASDA, or the car-detailing ones you can buy from a trusted detailing-products manufacturer. One of the biggest mistakes is to use a fabric softener when washing a microfiber towel. A fabric softener actually contains certain oils that “soften” up the fabric, and prevents mineral deposits when drying. But these oils clog up the microscopic shape of the fibers. This causes the microfiber towel to actually lose much of its properties. A drying towel won’t dry anymore, it will just wipe the water around without lifting and soaking it up. A microfiber towel designed to remove polish, will just rub the polish residue around without actually removing it from the surface. There is no perfect cure for this, but it helps to wash/soak the microfiber a few times with an undiluted acidic wheelcleaner. It is possible to create different towels with different properties. One microfiber can be designed to be really good at soaking up water, another fiber can be designed to remove polish residue. For certain characteristics it is even possible to combine fibers with each other. It pays off to invest in a good microfiber towel. 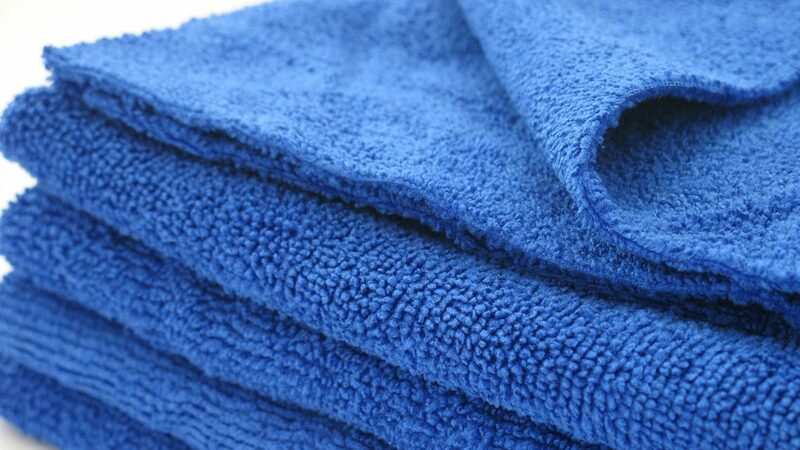 A good microfiber towel will help to prevent the need to do much polishing, or extra hard buffing. Good tools make your job a lot easier. Also pay attention on what the aim was when designing the microfiber towel. Is it made for drying? Cleaning? Using the right towel for the right job will help.